In a container, mix the yogurt with the honey. In a cup or small glass, add a layer of the apple compote. Add a layer of the yogurt-honey mix. Add a little bit of the granola and repeat the steps until you finish with a final layer of granola. 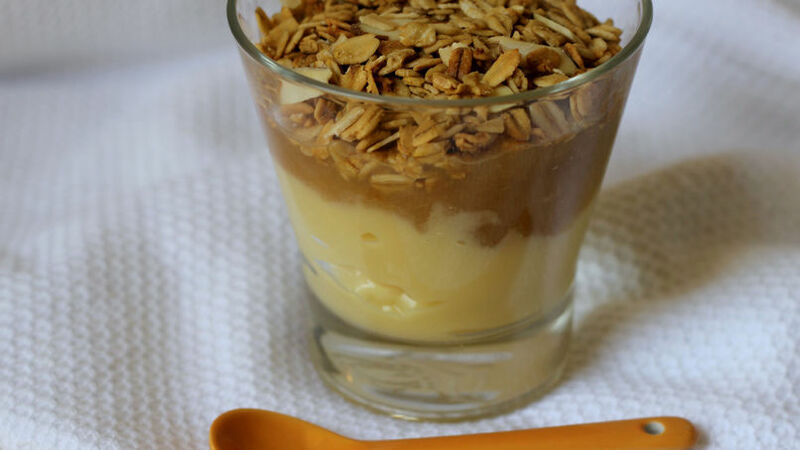 You can sweeten the yogurt with honey, or use French Vanilla Yoplait® yogurt. To prepare this delicious parfait, you can use homemade apple compote or premade compote purchased at the supermarket. Whip up these cups to mix up your children’s lunchbox menu, or to give them a pleasant afterschool surprise. Who would think that such a simple apple recipe could be so sweet?